Boys and girls in the Christian school where Amy teaches not only learn about missions, they also learn how to participate in missions. Each year during missions emphasis week Amy teaches her fourth grade class a CEF® missionary story. The children learn about the country where the story takes place, the culture in that country and the hardships the missionaries and local children face. 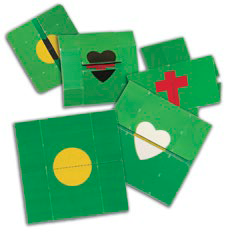 Amy and her class also share the Gospel with the entire school using the Gospel Flipper-Flapper™. This year Amy added something new—a fundraiser for missions. She heard about a CEF project to reach 10,000 boys and girls for Christ in an undisclosed country. One hundred percent of the money raised would purchase teaching materials for the workers in that country. Amy’s class wanted to help. They sold donated Gospel Flipper-Flappers and Wordless Book bracelets and raised $820! Their excitement grew when ministry partners matched the $820 for a total of $12,000! Through their effort thousands of children will hear the Gospel.